It's chaos, I tell you, chaos. That Thanksgiving is 27 days away and that Christmas follows 31 days after that. I have two Holiday Open Houses during the week of November 19th and my living room looks like a Christmas warehouse that threw up in it. Vintage and holiday items are strewn everywhere. It's a good thing my honey is up at deer camp hunting with his friends or I may have lost him among the garland and snowmen. It always amazes me how a room full of "stuff" can come together in a booth. Just last week, I was stepping over harvest items and yet, it all pulled together as shown in this pic of a 1930's play pen repurposed as a buffet by laying an old shutter (also from the 1930s) on top of it. So, as if I don't have enough to do, I stop in the middle of all of this to put together a new header for my blog. This shot is of a Spotted Moray Eel who was nested next to a huge spiney sea urchin. Those are the large, knitting needle size spines you see next to him. These creatures are as beautiful as they are frightening looking. As long as this is a mixed bag of blog conversation, why not close with a pic of me at work today. I knew it was going to be nutz here as it is on every Friday, so why not wear a "little" mask to break the hectic pace. When I was a little girl, my mother used to tell my sisters and I that her favorite color was “skyblue-pink.” My love affair with a box of Crayolo 64 crayons (with sharpener on the box), as a child, told me that skyblue-pink wasn’t a color. But mom would say that if I would watch the sky, God would provide that color magically before my eyes. 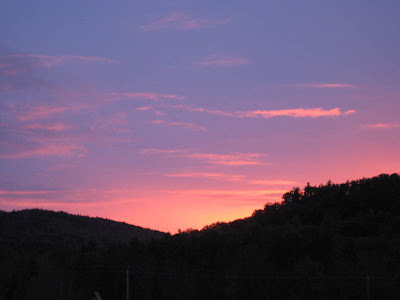 Mom was always right and I was witness to skyblue-pink in the sky many times throughout my life. My honey and I had just checked into our room at a hotel in Conway, New Hampshire for the evening. We had spent a marvelous day driving and walking all over the White Mountains. 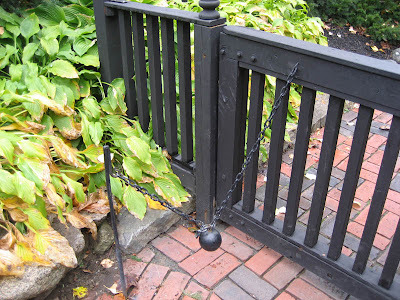 The leaves were turning and the air was cool and crisp…typical of fall in New England. 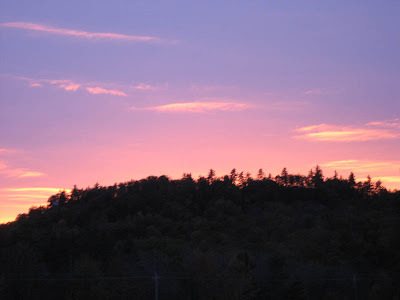 I had stepped outside to get my knitting from the car when the color, skyblue-pink was painted across the early evening sky. Smiling, I thanked Mom and our Creator for giving me this amazing canvas and I watched until the sun had set as the colors intensified and then bled together into a dusky blue. Sea Captain's daughter, a mermaid or perhaps even a Sea Witch! 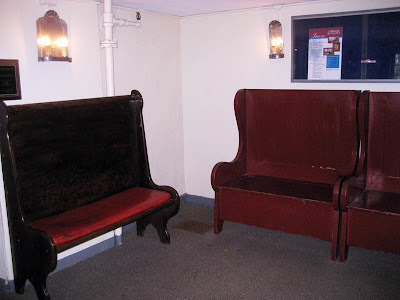 Part of the exhibit of "ladies" items at the Maritime Museum in Salem, MA. This sea shell encrusted dress looks like an offering straight from Project Runway and their found objects challenge. This seemingly size 14 beauty is encrusted with cowries, periwinkles and tiny clam shells all resembling bead work. I especially like the use of row after row of cowrie shells on the sleeves giving it the illusion of ruched silk. This really is the ultimate Sailor's Valentine and I can share that this "Sea Witch" was dying to try this on no matter what the weight of this dress felt like. Have a lovely White Wednesday and just a reminder that we turn our clocks back this Sunday, November 1st. Sweet Baxter has crossed over. Baxter the Therapy Dog, a San-Diego-area Chow/Lab mix who spent years providing care and comfort to humans at the end of life, died last Friday at the age of 19. After a puppyhood of abuse, Baxter grew up to become a certified therapy dog and enjoyed fame and fans worldwide for his years of volunteer work at San Diego Hospice, where he spent time cuddling, licking faces, and providing smiles for people in hospice care. The Doberman is pregnant. The fireman had just saved her from a fire in her house,rescuing her by carrying her out of the house into her front yard, then he continued to fight the fire. When he finally got done putting the fire out, he sat down to catch his breath and rest. 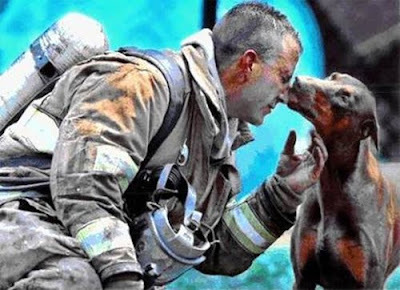 A photographer from the Charlotte , North Carolina News- paper, noticed the dog in the distance looking at the fireman. He saw the Doberman walking straight toward the fire fighter and wondered what she was going to do. As he raised his camera, she came up to the tired man who had just saved her life and the lives of her unborn babies and kissed him just as the photographer snapped this photograph. Such sweetness from God's creatures. St. Francis reminds us "Not to hurt our humble brethren [the animals] is our first duty to them, but to stop there is not enough. We have a higher mission: to be of service to them whenever they require it." Two of my favorite books are House of the Seven Gables and The Scarlett Letter by Nathaniel Hawthorne, one of America's greatest authors. (on a personal note, I believe The Scarlett Letter to be one of the great reads of literature offered to humanity. If we are honest, we can find a piece of ourselves in all of the main characters both good and bad, and hopefully have pulled lessons from them as well.) 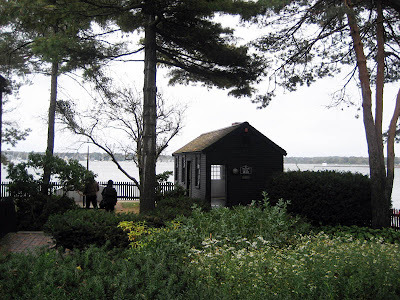 Having the opportunity to visit the Hawthorne's birthplace and the actual House of the Seven Gables was a real treat for me. Nathaniel Hathorne, born in 1804 in the city of Salem, Massachusetts later changed his name to "Hawthorne", adding a "w" to dissociate from relatives including John Hathorne, a judge during the Salem Witch Trials. 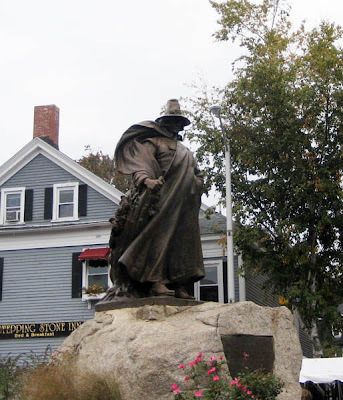 His writings center around New England and many works features moral allegories with Puritan inspiration. His fiction works are considered part of the dark romantic movement and his themes often center on the inherent evil and sin of humanity, and usually have a moral message. Statue of Nathaniel Hawthorne in Salem Square. 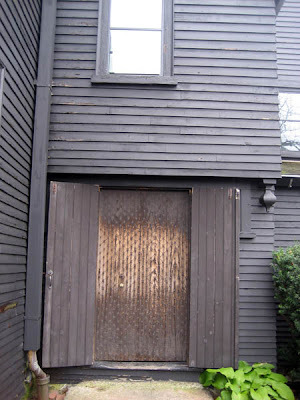 Entrance to the House of the Seven Gables or as it is known in Salem, The Turner-Ingersoll Mansion. 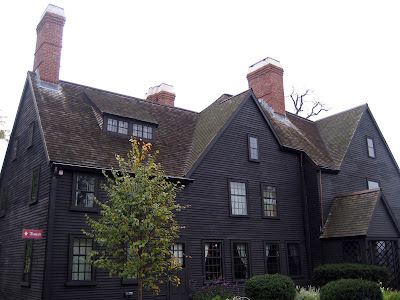 From the year 1668 up until the present day, the House of the Seven Gables has been one of the most famous structures in America. "Half-way down a by street of one of our New England towns, stands a rusty wooden house with seven acutely peaked gables facing toward various points of the compass, and a huge, clustered chimney in the midst." Hawthorne’s opening sentence to his novel The House of the Seven Gables manifests his fascination with the Turner-Ingersoll mansion. The mansion built by Captain John Turner stood out on the Salem seacoast as a symbol of wealth, but also a construction that produced awe and wonder. Turner’s mansion was an object of interest for Captain Ingersoll, who years later bought the house. Captain Ingersoll capitalized on the house’s waterfront location, where he conducted his trade during the Age of Sail. 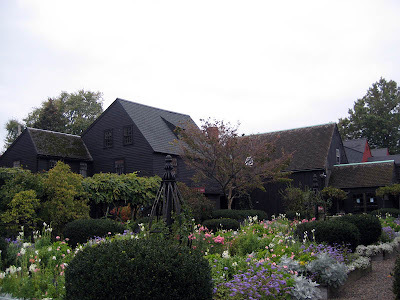 The history of the House of the Seven Gables is incredible. It only stands now due to one woman and her vision; Salem philanthropist Caroline Emmerton. She purchased the building, which, at that time, had only three gables, and hired Joseph Everett Chandler, a preservation architect, to restore it and interpret Hawthorne’s novel inside its rooms. In fact, the house only had three gables when Nathaniel Hawthorne knew it; the recollection of seven gables he immortalized came from his cousin’s youthful memories. This room is the only photo we could take indoors and is of the Settlement House (one room) that Caroline Emmerton built to "help new immigrants settle into American life." The back door of the Turner-Ingersoll house is beautifully reproduced from the original door and is constructed in the "Batten" setup. (a small piece of the original door can be seen in the attic of the home). 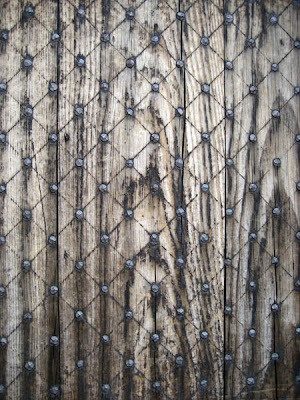 The Batten door on the outside is decorated with scribe marks in a diamond pattern and tacks. Nathaniel Hawthorne was a relative of the Ingersoll family and kept in contact with his cousin Susanna. From his visits to see Susanna, Hawthorne was also awestruck by the mansion and became inspired to write a novel based on the house. 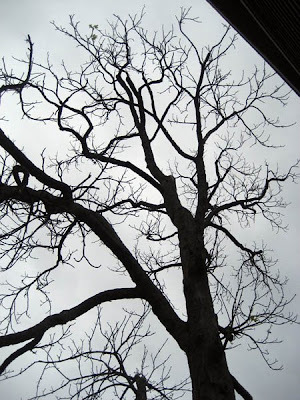 Even this tree takes on a haunting look with the grey sky on this damp, wet morning. 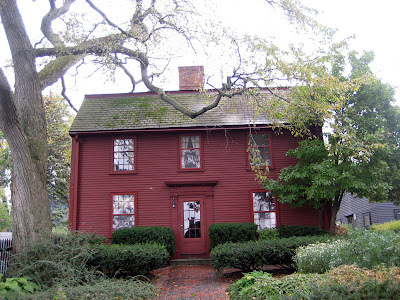 The House has taken on some characteristics that are described in Hawthorne’s book. The secret stairwell that is mentioned in The House of the Seven Gables was an addition to the house in the early 1900s. The tour of the house will allow you to climb the hidden staircase behind the fireplace, but the trip up is not recommended for people known to be claustrophobic. 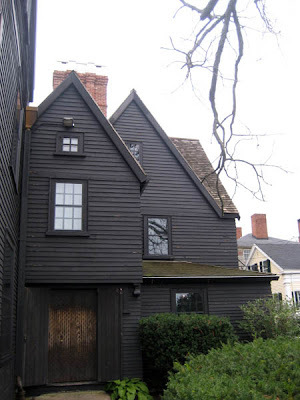 Another renovation was made to the house to make it more compatible to the house that Hawthorne depicts, is the shop that is opened by Hepzibah Pyncheon in The House of the Seven Gables. Hepzibah is forced from poverty to open up a small store, even at her old age. She was once a highly dignified person, who is now relegated to selling things out of her house to support herself. The character of Hepzibah strikingly resembles another Hawthorne character, Hester Pryne of The Scarlet Letter. Hester was also at a loss for dignity because of her adultery and resorted to selling her embroidery work out of her house as a means to support herself and her young child. Illustrated as looming, dark and mysterious in the novel, the house nonetheless has light, even romantic features. Its period gardens are charming, and the granite seawall running along the property provides a perfect perch to look over a calm, blue ocean that is filled with historical ships of different sizes. The Counting House built in 1830 is typical of the small buildings in which sea captains completed much of their business. This was a place to balance accounts, pay fees due, and figure profit before or after a sea journey. It is believed that Hawthorne first developed the idea for the Scarlett Letter while in the counting house. Lovely view from the counting house. 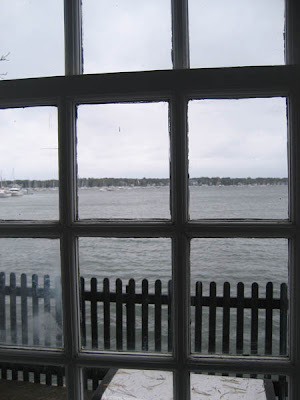 This is a sea captain's view and certainly an artist's view as well. Just looking out the window on the cold rainy day invoked inspiration. The muses were about when I looked out the window; how they must have teased Hawthorne as his most notable works were all borne from this location. Rolling hills of green? 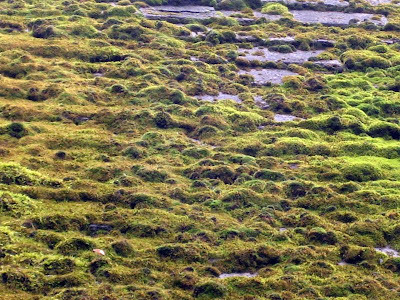 Look closely and you will see that this is moss. 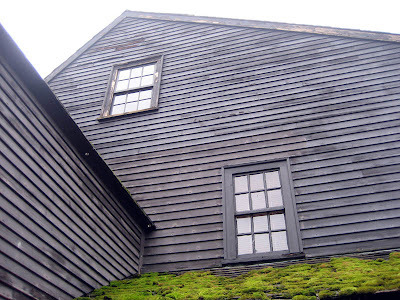 This rich, thick moss with its bright green color was growing on the north face of the roof. 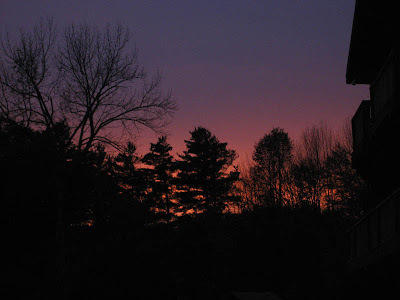 Loved the color as it stood out so brightly from the dark colonial paint of the clapboards. Hawthorne's birth and childhood home. Much smaller then the Turner-Ingersoll home, but just as lovely inside. I adore this architectural period and could easily live in any of these lovely old homes found in Salem. White Shell Wednesday - What is this made from? The likeness of the hard clam was spot on. The common hard clam, also known as a quahog (or quahaug), round clam, or simply chowder clam is an edible mollusk which is native to the eastern shores of North America. 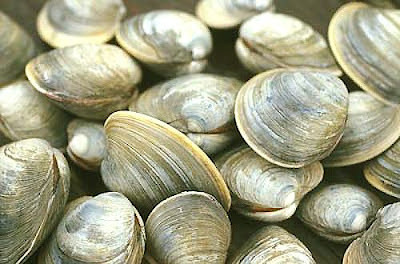 It is one of many unrelated edible bivalves which in the USA are frequently referred to simply as clams. 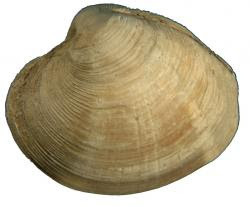 Fishmarkets have specialty names for different sizes of this species of clam with the smallest clams called countnecks, next size up are littlenecks, then topnecks. Above that are the cherrystones, and the largest are called quahogs or chowder clams. In coastal areas of New England, raw bars specialize in serving littlenecks and topnecks raw on an opened half-shell. Littlenecks are often found in-the-shell in sauces, soups, stews, "clams casino" or substituted for European varieties such as the cockle in southern European seafood dishes. 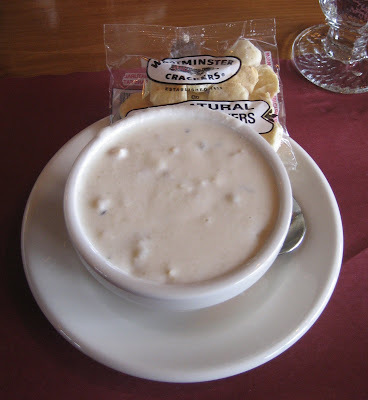 The largest clams, quahogs or chowders and cherrystones (with the toughest meat), are used in such dishes as clam chowder, clam cakes and stuffed clams. Thick, rich and creamy, clam chowder is stick to the ribs, home cooking and this bowl of local clam chowder was thick enough to stand a spoon in the middle of it and on the cold, damp day I ordered it, warmed the "cockles of my heart". One of the marvelous things about traveling is finding that unique little shop which is so unexpected and within lies wondrous things. RavenWood Curio Shoppe in Jackson, NH, nestled next to the Jackson Fire Station, is just one of those gems. 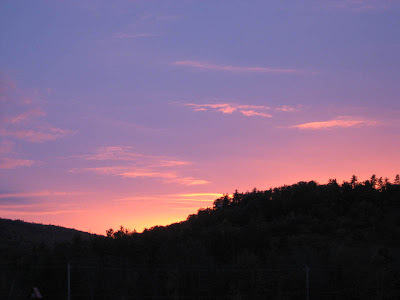 Jackson, a nice, cross country ski community and close to White Mountain ski slopes, is where RavenWood can be found. I passed this shop the evening before and it was ablaze with tiny lights which cast a lovely juxtaposition of light and shadows and I knew I had to come back to investigate the following day. The courtyard is filled with garden art, sculptures, and wind chimes of all sizes. Nearly all are created by local artisans and for hand crafted pieces, the prices are more than fair. Delightful rust patinaed sunflowers welcome you into the courtyard. These stood almost 6 feet tall. So many suns, so hard to choose, but my personal favorite is the turquoise sun above. Unique art glass and pottery abound. What I love about RavenWood are the antiques that are found in nooks and crannies all nestled between artisan pieces. A lovely marriage of old and newly created. These adorable metal bats hang from shelving units. I meant to purchase one of them before we left for our trip to Cathedral Ledge. I did find a wonderful gift for my sister here so I did not leave empty handed. Still, I wish I had grabbed one of those bats. Fell in love with these unique coffee/tea cups. Dragon claws hold the cup and if you look inside, you will find a claw piercing the mug. So clever. My favorite mug is the turquoise one. Perfect for a Sea Witch. Lovely metal ware and a nice gong. See the pretty mermaid on the wall? Such an unusual theme for a stain glass piece..birch trees frame the birch bark canoe. Lovely copper foiled piece. These wind chimes have the sweetest sound and are all recycled bottle glass that has been through an acid bath to give them a sea glass finish. I love these repurposed clocks made from vintage aluminum ice trays, found objects and yes, diskettes. Look at this wonderful computer board clock. Such a clever and contemporary use of obsolete circuit boards. Looking down from the second floor, so many wonderful things to see and purchase. And one more delightful clock before I end this blog. How clever, a pretty carriage made of found objects becomes an extraordinary mantle clock. How lovely is this sound?